A root canal is a treatment used to repair an infected tooth. Factors such as the patient’s general health, the extent of the infection and the anatomy of the tooth affect the outcome. 1. What is a root canal procedure? 2. Why is a root canal procedure needed? 3. When is a root canal procedure not possible? 4. What problems and pain can occur due to the root canal procedure? 5. Where can I find a suitable dentist? 6. How is a root canal procedure performed? 7. Which factors affect the outcome of root canal treatment? The tooth pulp is made up of connective tissue, blood vessels and nerves. When bacteria reach the pulp, it becomes infected. The infection creates swelling and increased pressure in the pulp. A tooth can recover from a mild or occasional irritation of the pulp. If the irritation continues, it can lead to an irreversible infection, and the tooth may become partially or completely gangrenous. A gangrenous tooth doesn’t have normal blood circulation or nerves. Toothache can be a sign of an infected tooth in need of root canal treatment. Toothache and throbbing are common symptom of an infected tooth. A mild infection can clear up, and the tooth can be fixed using a dental filling. Root canal treatment is needed when the tooth is severely infected or when tooth decay has reached the pulp. If the infection of the pulp is left untreated, it can reach the tooth’s roots or even the jawbone. Tooth root infection, also known as apical periodontitis, doesn’t go away on its own, and it has to be treated with a root canal. Tooth infection is often caused by untreated tooth decay. Bacteria inside the tooth can spread into the jawbone through the roots. If left untreated, the bacteria can cause severe infections in the head and neck area. Root canal treatment is performed when severe tooth decay, cracking or trauma has damaged a tooth that is worth preserving. It may not be a suitable treatment option if the tooth is too badly damaged. is poorly embedded in the jawbone (e.g., due to periodontitis). Root canal treatment may not be performed if a tooth has cracked or is poorly embedded in the jawbone. A tooth can be whitened if it becomes discolored following a root canal treatment. Needles used in root canal treatments sometimes break inside the root. This is particularly common when the root canals are ossified or curved. It is not always possible to remove broken needles. Broken needles often do not cause problems if the infection in the root is mild or fully healed. However, if a root cannot be treated because of a broken needle, the dentist may have to remove the whole tooth. General dentists and dental specialists perform root canal treatments. They estimate the need and extent of the treatment before performing the procedure. The cost of a root canal procedure depends on the extent of the procedure; therefore, dentists don’t usually give fixed prices in advance. The number and length of the necessary visits affect the price. It is a good idea to ask for advice from your current dentist and from your friends when looking for a suitable dentist to perform the procedure. Consulting different dentists may also be a good idea, particularly if the problem is extensive and doesn’t require urgent care. Some dentists offer free consultations. The flip side of these free consultations is that their cost is often included in the treatment price. An examination of patient’s tooth and mouth always precedes root canal treatment; this is done to predict problems and to ensure that the treatment is needed. The examination includes X-rays, which reveal the extent of the infection and the number and shape of the roots. The purpose of root canal treatment is to remove microbes from the tooth pulp and roots. Depending on the extent of the infection, two or more visits may be needed to treat the problem. 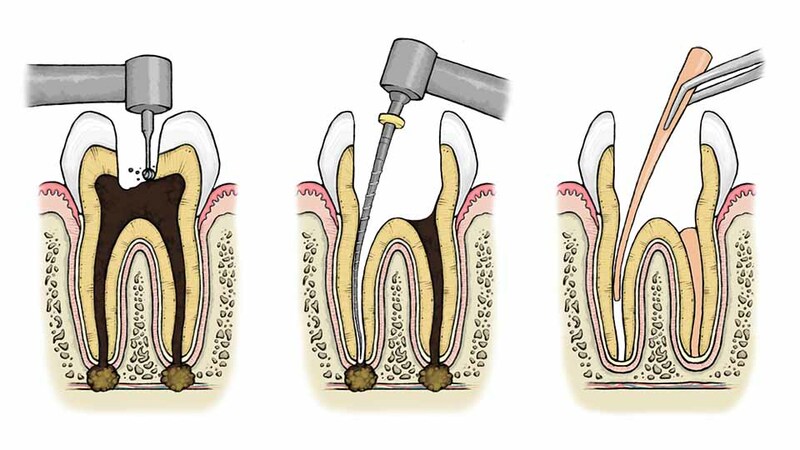 An opening is drilled through the biting surface to allow access to the tooth pulp. 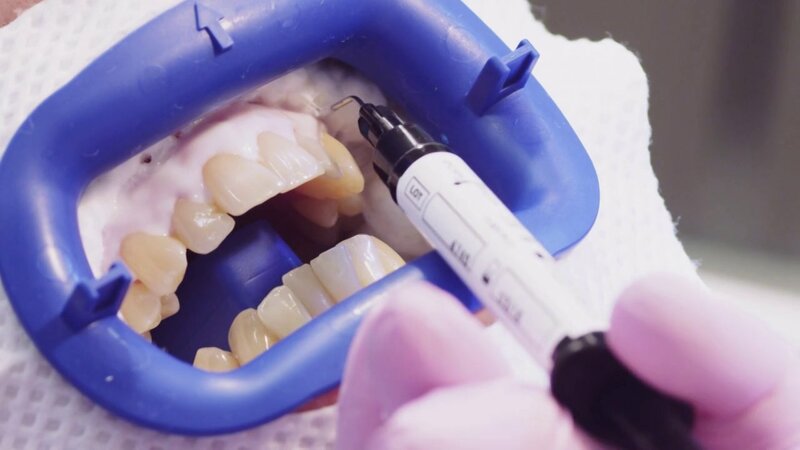 Tooth roots are cleaned and disinfected using special needles and rinsing substances (e.g., sodium hypochlorite, EDTA, and chlorhexidine). The dead and infected tissue is removed from the roots both mechanically (using needles) and chemically (using rinsing substances). A strong alkaline substance (Calcium hydroxide) is placed in the root canals. This kills any remaining microbes and helps cure the infection. Sometimes a several-week break is taken between the visits, during which time the infection usually gets better. The procedure may be repeated during follow-up visits. A filling (gutta-percha) is placed in the empty root canals. 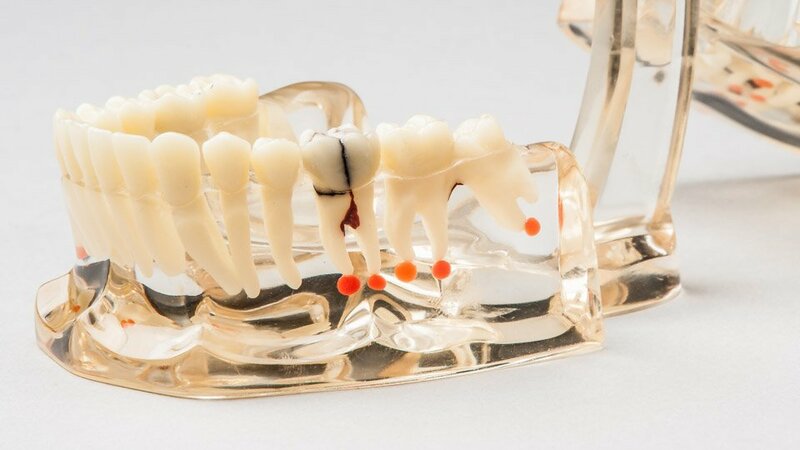 This prevents microbes from entering the canals and re-infecting the tooth. 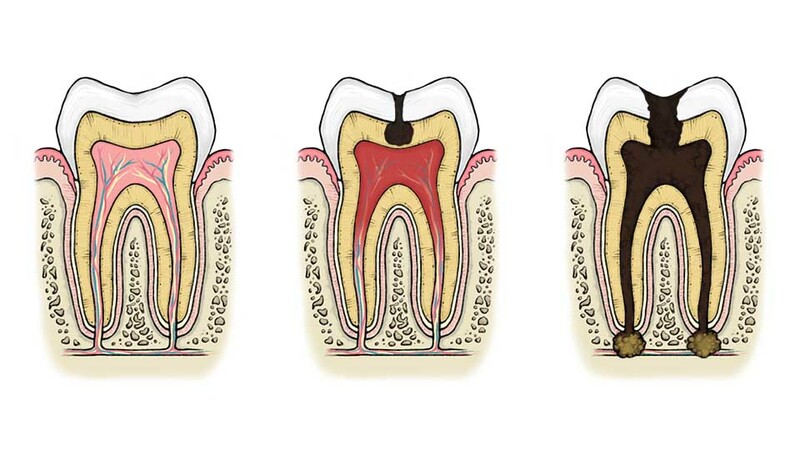 During root canal treatment, dead and infected tissue is removed from the pulp and roots using special needles (middle), and the tooth is disinfected with rinsing substances. A root canal filling is then placed in the empty roots (right). Root canal treatment is usually done to treat an infected tooth. The treatment is considered successful when the infection disappears and the tooth works properly and looks natural. Although root canal treatment can be performed in most cases, it can be difficult to predict how successful it will be. The following factors influence the outcome. Root canal treatment and the patient’s general health determine how well the infection can be cured. Some diseases (e.g., diabetes) and medications (e.g., those for cancer or rheumatoid arthritis) weaken the body’s defense system, and root canal treatment may not be as effective in treating advanced tooth infections in these cases. A tooth root infection that has spread to the jawbone (apical periodontitis) is usually treated with a root canal, but it is difficult to predict the outcome. If the patient’s general health is poor or there are other risks involved, tooth extraction may be a better treatment option. The extent of the infection and the quality of the microbes affect the outcome. Certain bacteria (e.g., Enterococcus faecalis and Streptococcus mitis) are hard to remove with the substances and antibiotics that are used in root canal treatment. It is more challenging to perform root canal treatment on a tooth that has multiple roots. 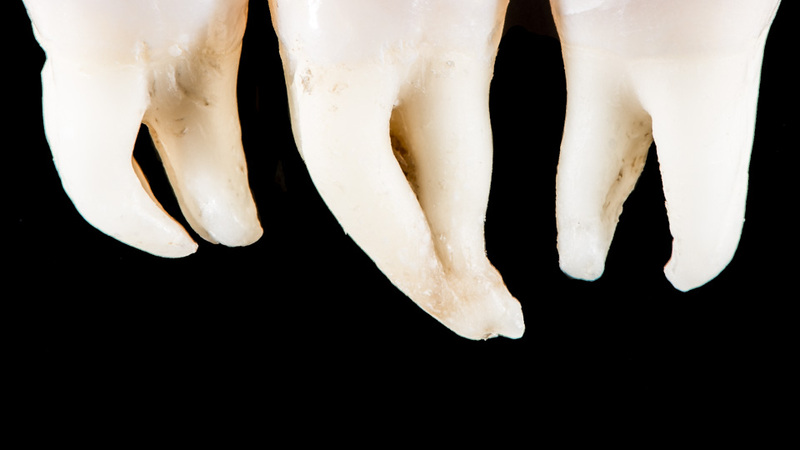 Incisors and canine teeth usually have one root; premolars have one or two roots; and molars have three or four roots. In addition to the roots’ number and location, their shape influences the procedure. Although tooth roots are usually relatively straight or slightly curved, they can also be crooked, in which case performing a root canal treatment can be challenging. It is easier to perform root canal treatment on single-rooted incisors than on teeth that have multiple roots, which are located in the back of the mouth (pictured). Sometimes, tooth roots are partially or completely ossified, making it challenging if not impossible to clean the root canal. The tooth is restored after root canal treatment to ensure its longevity. The roots are protected, and the tooth is restored back to its full function and natural appearance. Small holes and other damage can be fixed using plastic or amalgam fillings. 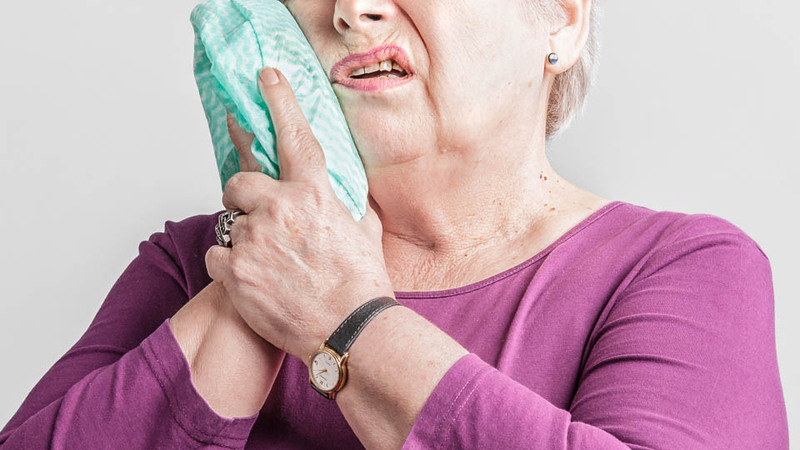 More severe damage should be fixed using golden or ceramic fillings to make sure the filling remains tight against the tooth and that the tooth can withstand the forces of chewing without cracking. Ahmed HM, Abbott PV. Discolouration potential of endodontic procedures and materials: a review. Int Endod J 2012;45:883-897. Becker DE, Reed KL. Essentials of local anesthetic pharmacology. Anesth Prog 2006;53:98-108. European Society of Endodontology. Quality guidelines for endodontic treatment: consensus report of the European Society of Endodontology. Int Endod J 2006;39:921-930. McGuigan MB, Louca C, Duncan HF. Clinical decision-making after endodontic instrument fracture. Br Dent J 2013;214:395-400. Narayanan LL, Vaishnavi C. Endodontic microbiology. J Conserv Dent 2010;13:233-239.